If anything in the way of authenticity can be claimed for versions of Peter Pan the choice must fall on its performance as a dramatic extravaganza. Only thus can its heterogeneous whimsy be justified. Its origins however lie in a fanciful volume that preceded the play: The Little White Bird (1902) from which chapters were later excerpted after the pantomime’s success and published, with illustrations by Arthur Rackham, as Peter Pan in Kensington Gardens (1906) – a work which has just been issued in Britain from the New York publisher Dover Books but sporting only the artist’s colour plates and not his pen drawings (978 0 486 46607 1, £15.99 pbk). Some of the latter (but not the plates) are given in a recent reprint of Barrie’s dotty text in the pretty little Collector’s Library series from CRW Publishing Ltd (978 1 905716 40 1, £7.99 hbk). 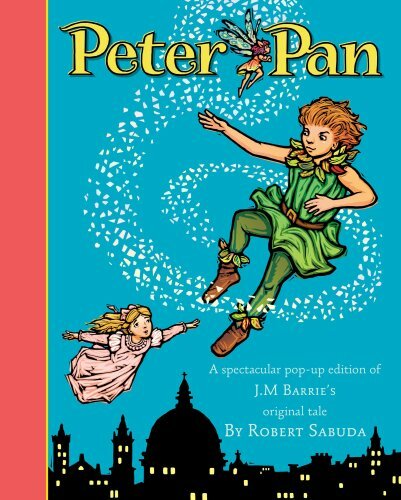 This volume has the advantage of including the other important core text, apart from the play: Barrie’s own storification of Peter and Wendy (1911) with neatly reduced versions of F D Bedford’s finely detailed drawings. Between them these reprints may give you a measure by which to judge Robert Sabuda’s latest venture into the popping-up of the classics. His skill as a designer of elaborate movables has been widely bruited over the last few years and with simple subjects like nursery rhymes he is wonderfully ingenious; but here the combined forces of Pan, Hook, Red Indians, Mermaids, Lost Boys and all have overwhelmed him. The five major pop-up openings are both ugly and vulgar – crudely drawn, subfusc, and too complex for their own good. Their clumsy construction also gets in the way of the travestying of Barrie’s text which has to be read in little booklets awkwardly attached to each spread. These have dreary pop-ups of their own but can only be read by fighting the intrusive scenery of the full-scale ones which get in the way of your fingers and your sightlines. Whether or not you harbour reservations about the whole Pan industry you will probably agree that Barrie deserves better than this.